October 1 security patch - bluetooth issues? A couple weeks ago, I got the August 1 security patch through T-Mobile...and just yesterday I got the October 1 patch. I thought it seemed kind of odd to get two so close together. Today, however, I started having bluetooth issues in my car. It kept shutting down, giving me an error message, and then restarting. The bluetooth icon in the status bar was rapidly flashing grey & white. Is anyone else having bluetooth issues on the October patch? Same issue I am experiencing after the update. Received update over the weekend and noticed that my phone was disconnecting/connecting to my car about every 60 seconds today on my way to work. Also, seem to be having issues with my location services in some of my apps as well. Tried it. Doesn't work. I thought I was the only one having this issue. Its super annoying. I did the update and haven't experienced the issue. 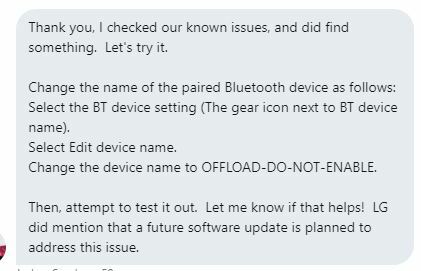 Have you tried forgetting and then reconnecting the bluetooth connection with the car? What cars are experiencing this? I have a Prius Prime. Connection problems since the update. Reconnecting doesn't help. Changing the phone name as described above doesn't help. Really hope they push out an update to fix this soon. Yeah. Same thing...but I have a Honda Accord. I called T-Mobile. On the positive side, their customer service has been noticeably better since they made a commitment to improve it. Unfortunately, despite trying for 45 minutes they were unable to help. They said they will make this a priority for their technical staff and will follow up with me. I don't know if it's related to the update, but I had some WEIRD sh...stuff...go down with my phone Friday evening. It was working fine...then suddenly wasn't. I couldn't turn the screen on. No buttons worked and I was afraid it was bricked. I thought perhaps there was a bigger battery drain than expected and maybe it had just run down, so I plugged it in. Immediately the screen lit up and the battery indicator said 60%. All the notifications began popping up and the sound was very messed up, as if the speaker was dying. I couldn't get the screen to respond consistently, so I managed to reboot it...and suddenly it all started working fine again. Like I said, I'm not sure if it was just a random thing or if it was related to the update...or some other bug caused by an app. Timing just seems suspicious because of this other issue I have with the bluetooth. LG support is not very useful. Their recommendation is just to factory reset. I'm having the same problem connecting to 2012 toyota camry car stereo after the update. I got a warranty replacement G6 from Tmo and it also happened on that phone after the same update. We need people to call and bother them about this or they wont do anything about it. I've done this multiple times and it does not help. HockeyPhool and j_grouchy like this. I'm also having the same issue (LG G6, 2017 Subaru Forester). I've tried unpairing/re-pairing, force-stopping Bluetooth and deleting data, editing the name of the car's Bluetooth device, and today I did a full factory reset on my phone. As soon as I re-paired it with my car, the Bluetooth app started crashing again. It cannot stay connected no matter what. I think I found a temporary work around until T-MOBILE (hopefully) sends out a fix. I was able to disconnect the phone as an audio player and only use it for phone calls. This seems to make the connection more stable. unfortunately, I need to redo it every time I start the car. Also means no Pandora or podcasts for now. I just wanted to add my voice to this thread and say I'm also an LG G6 owner having the same issues as everyone here. Some Reddit user recommended enabling dev options and changing the AVRCP to 1.3. although it seems to have worked for a couple people there, it didn't work for me. So far the only stable use I get out of it is doing exactly what Amyshubby said above and only use it for phone calls. So the AVRCP 1.3 thing seems to have worked for calls. I honestly rarely use BT in my car for anything else, so I haven't really tried music/streaming. I assume it would work okay since the craziness seemed to be happening on its own without actually being in use (it was cutting in and out without me even trying to call with it). I'm pretty disappointed that they haven't rushed out a fix for this, though. Just goes to show how quickly they shuffle priorities down to the bottom of the deck for any phone older than 8-12 months. Hey everyone. Just wanted to update and add that after changing to AVRCP 1.3, clearing Bluetooth app cache, renaming my head unit in Bluetooth settings, uninstalling my Toyota entune app, updating my trucks head unit firmware, unpairing and repairing the phone with the head unit, and then power cycling my phone, I managed to get some stability. After doing all that, I can now get audio to play, but it will still immediately crash when I first connect to the car, and then again when I try to play music. After the first crashes are out of the way it seems to stay connected for the duration of the trip. November security patch is now starting to roll out on T-Mobile. I just installed it now, though I had no prior issues. I've updated to the November patch. No reason to use my BT in my car this morning, but if I see any issues I'll report back about them. Updated a week ago to November patch. Deleted phone from my Toyota and deleted Toyota from the Bluetooth list on my phone. Powered off and restarted phone (did not factory reset). So far no crashes and I use the car for at least two hours a day. Listening to audiobooks and streaming music again. Seems problem is resolved.